So just how prevalent are medical errors in Iowa? 1. Iowans’ real-life experiences with patient safety/medical error issues. 2. Were Iowans who experienced a medical error informed of the error? 3. Did Iowans who experienced a medical error report the error? 4. Does the Iowa public seek information about patient safety before receiving care? 5. 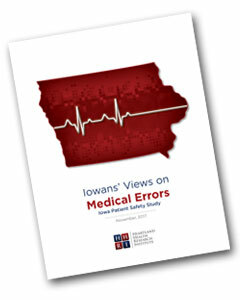 Public attitudes about patient safety/medical error problems in Iowa. 6. Do Iowans support greater reporting requirements on patient safety? Unless otherwise indicated, the statistics on the total respondents presented within the Iowa Patient Safety Study© are accurate to within plus or minus 3.1 percent, at the 95 percent confidence level. That is, the reader can be 95 percent certain that the results presented for total respondents are plus or minus 3.1 percent from the true value that would be found if we could interview all Iowans. 1Institute of Medicine. To Err Is Human (1999). Washington, D.C.: National Academy Press.